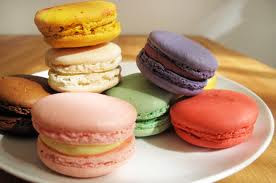 Macarons are little bites of heaven. Once you've had it, you'll be constantly fiending for it and finding yourself wanting it every chance you can get. The first time I've ever tried a macaron was at Pierre Herme in Paris and it was also the best I've had so far. Since macarons are not as popular in the US as it is in Europe, it's been virtually impossible to find a place in NYC that makes them with the quality that is exquisite in both taste and texture. Some of the places that do sell them tastes somewhat stale or bland. The macarons at Bouchon bakery were sub-par at best. A lot of these places never seem to get it quite right. The shell should be slightly crunchy and the center rich, chewy, with a meringue-like texture. I realized my infatuation with these colorful little french cookies was beyond normal when I found myself searching all over NYC for the ultimate macaron. My hunt was over when I found La Maison du Macaron. So far, this is the only place that came close to the one I had in Paris. This little bakery has a variety of flavors to choose from. 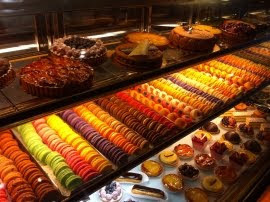 These colorful, petite pastries all looked so good, if I could, I would gorge myself and eat them all. But sadly, at $2.50 a pop, all I could buy was a few to satisfy my craving. The Caramel Fleur de Sel was a popular flavor and won't disappoint those who love caramel. The white chocolate coconut was a favorite of mine. It instantaneously melts in your mouth, and that hint of coconut complements the chocolate so well. It's so sweet and satisfying, it's almost orgasmic. At the end of the day, I had to remind myself that I'm not in Paris, and if you want a good macaron, this is definitely the best you'll get here in New York.